My husband started a blog. 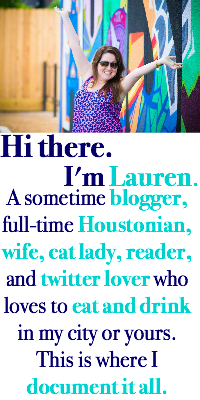 It's a blog about food in Houston. If you want the URL, I'll share, but this isn't about him. It's about me. I started blogging two years ago. Most of my blog friends I met, oddly enough, before I actually read their blogs. I met them at blog meet-ups and here we are, years later (in some cases), real life friends. And it's awesome. Andrew has liked twitter for the information aspect for as long as I can remember. I don't remember where or when he started tweeting or replying to people and I don't exactly remember what it was that made him decide to start a blog. Since he's been doing both, he's made his own twitter friends: mostly, other men who eat barbecue, tweet, and sometimes write blog posts about it. So he made plans to meet these guys in person and it was really funny to me that he had to tell them his name beforehand because they only knew him by his twitter handle. And he has hung out with them multiple times, but it took them weeks to exchange phone numbers; they made plans via twitter DMs. It's still their primary source of communication. We text during the day, but if I want to know what he had for lunch, I check his instagram. I also search his twitter handle while I'm at work during the day to creep on the witty banter he's exchanging about food. I'll text him when he's funny, or when I think his tweets are lame. I like that I can peek at his conversations with others. I proofread his posts and set up his google analytics.I add in the Oxford comma whenever necessary. And I edit photos, which must mean I love him, because I barely edit them for myself. When a poorly written post by another blogger is getting a lot of undue praise, we commiserate together. We share a laptop and have to plan our blog posting nights accordingly. Some posts take longer to write than others, and if inspiration strikes both of us simultaneously, the one who gets to the computer last is left whining for the other to hurry up all night. I wonder if our weekend dinner plans to try somewhere new are a fun date for us or fodder for his blog. Now, I'm the one who pauses before taking a bite to make sure he doesn't need a photo of my dish for his blog. I go along with him on barbecue trips and laugh when he introduces himself to people he "knows" online as "Andrew... um, I mean (twitter handle)." I think it's fun and it's funny. I like that we can share some things, but they're still our own. The blog worlds we're in are so different and we have different metrics of blog success. I see the way I am, when I'm a little internet crazed and I won't look away from the screen, at times when I look at him. It's nice to have it in common, but it's even nicer when we put it away and just live life. I am fairly certain if Jason had more time, he'd be the foodie critic in the fam - he loves Yelp and is always on Twitter - for info and news...is that a guy thing? If I lived near you, I'd totally read his blog and I am sure want to eat everywhere! I think it's great that he's getting more into his BBQ/food passion by writing about it, making friends who enjoy the same things, etc. I read a few male blogs here and there. It's refreshing. This is awesome, Tyson could really care less about blogging and the internet in general mostly. My new mommy friends and I communicate via a secret FB group and Snapchat mostly although we do have phone numbers for group texting of play date info. Food blog power couple, that's so awesome! But even more awesome is your stance on the Oxford comma. This is so cool....except sharing the computer part ;) I told P he could do a beer blog, but he would probably drive me crazy with questions. He is SO off-line. He doesn't do any social media (unless you count Linkedin). I would like to be able to talk blogging stuff with P though, that would be nice. Glad to see you your post!! John tries to be understanding but he doesn't get blogging at all (or anything having to do with computers or social media or writing) so I think it would be so fun to have someone there all the time who gets it! But it is nice that he's so off-line, it makes me put the computer away when we're together. Ahhh blogging. oh my gosh, that's AWESOME! My husband is a really good cook and loves cooking. He decided to start a blog. I helped him set everything up and he did one post and that was it!! I love that he found some local guys to hang out with and discuss BBQ. It's nice that you can share the craziness of blogging and understand it together. I think it's so great that it's something you can share while doing it differently. I would love the URL! I think it's adorable that you proofread his posts! It's so cute that you guys can share that together!